Triple Gold is all good and well, but there is something remarkably better than simply Triple Gold. Click here to play! Have you guessed what it is yet? Of course you have. It's Triple Triple Gold! Play this three-reel slot machine across a single pay line. 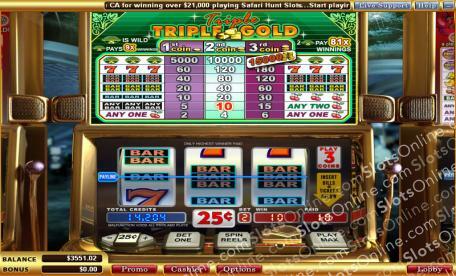 Traditional gamers lap it up because this is one of the finest and easiest slot machines available online. The Triple Triple Gold symbol is wild and can earn you a stack of cash if you manage to spin up three at once; 15,000 times your original wager is waiting for you if you do. There is no need for bonus games or scattered symbols because Triple Triple Gold pays out excessive amounts of cash simply for winning on standard combinations. If you have played Triple Gold and are looking for something a little more exciting - and a lot more exorbitant - hit up Triple Triple Gold today and multiply your winnings! The Triple Triple Gold symbol is Wild and will also earn you up to 15,000 times your bet depending on how many you spin up!